This is about benchmarking Perl. It combines several projects: the actual benchmark suite, tools to bootstrap a complete Perl+CPAN from git, a results database and chart rendering. This will by default build a "blead" Perl in ~/.bootstrapperl/, install CPAN with dependencies, run benchmarks and print out the results on screen at the end. After --perlformance you can provide other versions via --version=v5.14.2 or --version=01725c1~3; basically any rev that "git" understands. benchmarkanything.org has more info about the used benchmark result abstraction. 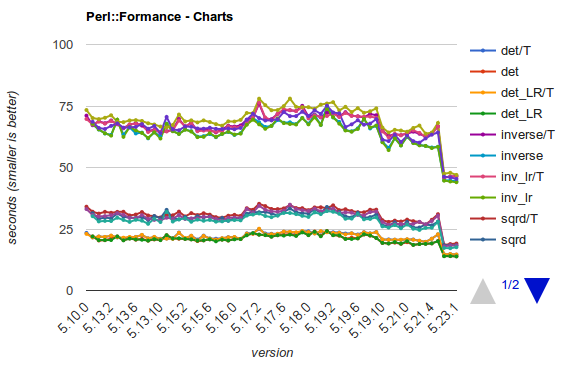 Benchmark::Perl::Formance is the framework for running benchmarks. It requires just a few dependencies and runs a basic set of benchmarks. Task::PerlFormance provides the full set of benchmarks via dependencies from CPAN. You have a code snippet worth to measure over many Perl versions? Create a ticket with details, or even better a Pull Request. You have a server from where you want to regularly report results to my central results DB? Contact me.